Robert Cain, founder and president of SeaAgri, stops by The Appropriate Omnivore. 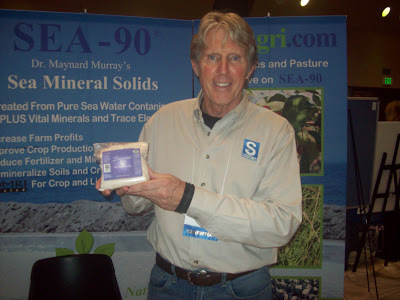 Robert founded his company, which produces sea mineral solids, after reading the work of Dr. Maynard Murray. From reading Dr. Murray, Robert learned our soil is missing minerals and that taking minerals from the sea can help replenish the soil to grow more nutrient dense plants. His company SeaAgri has created the product SEA-90 to provide better fertilizer for our plants. In addition to crops, Robert has found that SEA-90 works well with livestock, providing better tasting meat and poultry. SeaAgri has also started selling Seasons 90, a gourmet sea salt. And Robert gets into explaining the difference between sea salt and earth salt.